Following the recent global human right abuses, which range from political, economic and social discrimination, endangering indigenous knowledge and culture, militarization of lands, incarceration, killings etc… targeted against the Indigenous Peoples which includes Biafra, West Paupa, Kurdistan and others; the Bishop of Rome and the leader of the worldwide Catholic Church has called on the world to end these hostilities unleashed against indigenous peoples. In his recent tweet which was favorited by over fifteen thousand people in less than 38 hrs, the Pontiff could not hide his dissatisfaction over the world's negligence towards the indigenous people as he entreated the world to give ‘’respect to indigenous peoples whose very identity and existence are threatened’’. Owing to the recent demonstrations of outright and unmitigated abuses of human rights by the Nigerian government, it is no longer questionable that Nigeria positions as the arch culprit of this malicious and spiteful crime globally. Nigeria, though a signatory to the United Nations Declaration on the Rights of Indigenous Peoples, has repeatedly trampled on these rights in a very unremorseful way. Nigeria had conducted countless pogroms against the indigenous people of Biafra on several occasions before her Russia-Britain alliance (1967-1970) to erase Biafrans from the face of the earth. Thanks to Biafra’s first non-indigenous martyr, Bruce Mayrock, a student at Columbia University, who set himself ablaze at the premises of the United Nations in New York City on 30th May 1969, the attention of the world was drawn to the Biafran genocide and the war ended on the grounds of ‘’No Victor, No Vanquished’’. That would not suffice Nigeria… the war never ended. The mere existence of Biafrans had seemed to be unacceptable by the Nigerian government, our culture is threatened and we are exploited by all means. To Nigerians: -Biafrans should be exterminated, Biafra should have been ‘’dead and buried’’ (Olusegun Obasanjo) and there are no grounds to ‘’negotiate’’ our existence (Mohammed Buhari). Read also:SHALL WE CONTINUE IN THE AMALGAMATED NIGERIA UNTIL WE WILL ALL GET DROWNED WITH BUHARI? “Opening fire on peaceful IPOB supporters and bystanders who clearly posed no threat to anyone is an outrageous use of unnecessary and excessive force and resulted in multiple deaths and injuries. In one incident one person was shot dead after the authorities burst in on them while they slept,” said M.K. Ibrahim, Country Director of Amnesty International Nigeria. 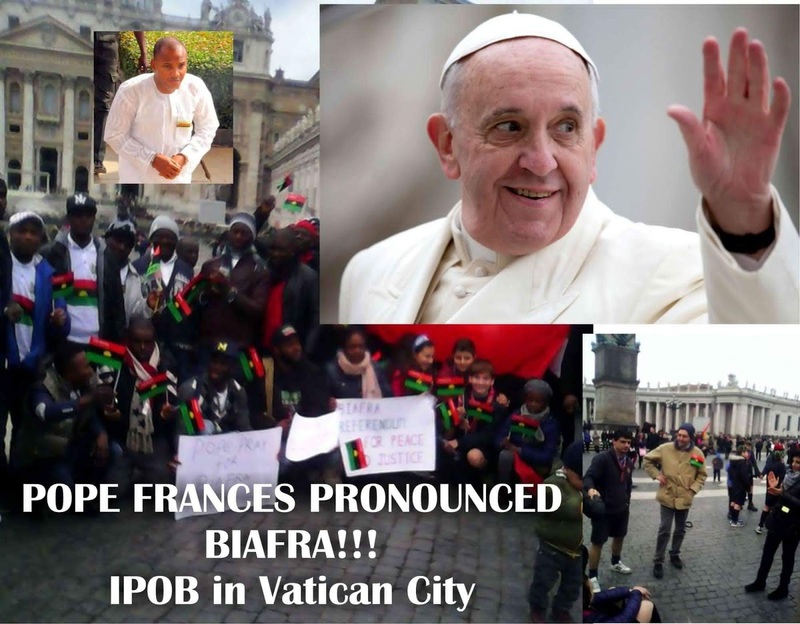 Consequently, Biafrans together with all indigenous people (whose identity and existence are threatened), enjoin the world to explore every means in ensuring that Nigeria is not only convicted of her crimes against humanity but with immediate effect, discontinue the abuse of human right against the indigenous people of Biafra.